Education Secretary Arne Duncan visits with young student Mario Corona, age 6, in kindergarten at McGlone Elementary School in the Montbello section of Denver, in this May 14, 2015. White and Asian students continue to do better on tests than black and Latino students, says the U.S. Department of Education. 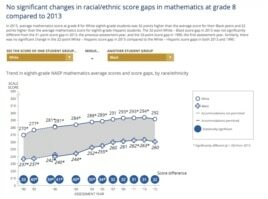 This information, which comes from the government’s 2015 Nation's Report Card, shows a long-lasting education gap between racial groups in the United States. In 2015, white students scored 26 points higher than black students on reading tests, on average. Marcelo Suarez-Orozco is an education professor at the University of California-Los Angeles. She says that Latino and black students face challenges that prevent them from excelling. ”Both Latino children and African American children are once again attending schools that are highly segregated. They are highly segregated by race, by poverty, by language by legal status," said Suarez-Orozco. One reason is classroom attendance in primary and secondary school. As students miss more classes, they become less likely to score well on tests and graduate from high school. In general, students from low-income families in the U.S. are more likely to miss class because of health problems, such as asthma and tooth decay. Transportation problems and difficult home environments are other factors. Black and Hispanic students in many regions are more likely to miss classes than white students, says a report from Attendance Works, a non-profit organization. Poverty, language, legal status and race are all factors that contribute to an achievement gap that continues into college, says Ken O’Donnell, California State University’s Senior Director of Student Engagement. If a student is the first person in their family to go to college, they face many difficulties. They do not have the same support that other students might have, says O'Donnell. The achievement gap, explains O'Donnell, can have serious effects. Students who are not prepared for college are more likely to leave school. Or they might take longer to graduate. This means that they will receive the benefits of a college degree late – or perhaps never. The achievement gap is not only a problem in the U.S. In many countries, some groups do not perform as well as others. Finland is considered by many to have the best education system in the world. But it, too, has problems with the achievement gap. The Economic Policy Institute released a report in 2013. It found that in Finland, low-income students score higher than low-income students in the U.S. on the PISA test. However, from 2000 to 2009, low-income Finnish students' scores went down. During the same period, low-income US students' scores went up. In other words, Finland is starting to have problems educating low-income students. For now, some schools are better than others at preparing students for college. At Harbor Teacher Preparation Academy, teachers talk about college as soon as students start high school. Teachers try to build the confidence of students. And they try to help students on an individual basis, says Principal Jan Murata. “Unless you reach that child and show that you care and get the students there and believe in them, then it makes it really difficult," said Murata. Another way to help students is to help their parents. Mark Gaither, a principal at a primary school in Baltimore, allows parents to come to the school's library every Monday. There, parents can learn how to help students with homework, check out books and get comfortable in the school environment. For many of today’s teachers, UCLA’s Suarez-Orozco says reaching students means understanding the cultural, language and economic difficulties they face. “So knowing your students, knowing where they are coming from, knowing their communities, [are important]" he said. In October, the Obama Administration began a program to combat the problem of students missing school. The effort is called "Every Student, Every Day." Its goal is to identify and help students who miss around 18 days, or 10 percent, of school days in a school year. Through the "Every Student, Every Day" program, the departments of Education, Health and Human Services and Justice, among others, will work with local and state governments to stop students from missing too much school. Only time will tell how successful this program will be. segregate – v. to separate groups of people because of their particular race, religion, etc.